If you are staying in the East End area (Cowpet, Elysian, Sapphire, Ritz Carlton, Sugar Bay) you probably have seen the stretch of bars and restaurants in RedHook. The whole stretch can’t be more than a 1000 ft, but it could take your entire vacation to hit every bar and eatery so I’ll just touch on a few favorites. 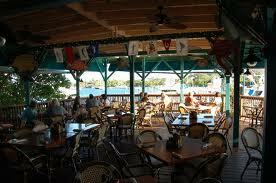 Fish Tails is a waterside restaurant, has all the fresh seafood you would expect of a Caribbean seafood restaurant. The wide open dining area is comfortable and suitable for a long leisurely meal. Ask the owner/manager Reggie what the fresh catch of the day is, which is hauled in earlier that day and brought fresh to this seaside restaurant. When I’ve gone to Fish Tails I tend to gravitate to their shrimp and clam Po Boys. Might not be the first thing people look for when they’re going to get seafood, but I tend to be a creature of habit. They also have a tuna chip dip on the appetizer menu which is excellent. There is a smallish wrap-around bar which is usually a great gathering place for small groups. Latitude 18 is technically not in RedHook, but it is within shouting distance. It is on the opposite side of the bay from RedHook. The road to get there is treacherous, but this little spot is a true pirate’s hideaway. The gritty feel belies the fact that the food selection here is varied and delicious. 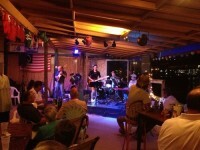 And most nights a local band is jamming on the tiny stage. This place is truly an original and totally unique on the island. Try the Mahi Mahi Creole. Or, if you are not into seafood, their burgers are done to perfection. The dining is casual and attracts local and transient boat folk from all over so the atmosphere is eclectic and so are the people. 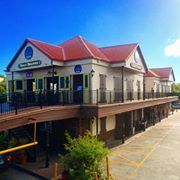 Traditional Irish Pub in the Caribbean? 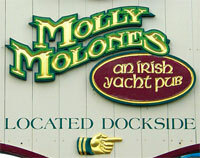 Molly Molones is the real deal. Probably the best place to grab breakfast, and they do lunch and dinner as well. I get their “big breakfast” with eggs, bacon and pancakes before I head on a boat trip to the BVI from Red Hook. I don’t need to eat until dinner. The plate of food is huge and delicious. For something quick or to take with you, get the best pizza around at Senor Pizza. Located below Fat Boys, they have a small dining room that is what you would expect at an island pizza shop. But I think the best way to enjoy Senor Pizza is to grab a whole pie and take it back to your hotel or villa after a day of boating or drinking. 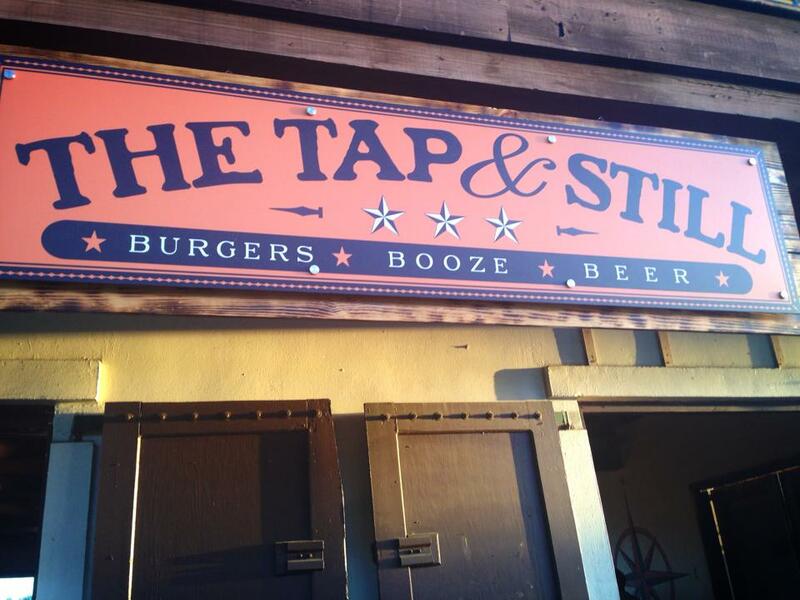 When Tap & Still opened in 2013 who knew it was going to be such a hit? Hooman. Hooman, a journeyman restaurateur in St. Thomas, has run this restaurant that pretty much contains the menu on its sign. Burgers, Beer and Booze. He ran it so well that he opened other Tap & Still in Havensight. The guy is good. It is a burger and hot dog joint with a pirate/rock-n-roll feel. 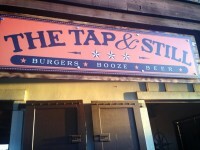 The Tap & Still has a large selection of beer, simple seating and decor and a solid collection of booze to pair up with one of their monster burgers or hotdogs. And the newest player to arrive to the Red Hook area is Topside (above Molly Molone’s). I have no idea if this place is any good. The few reviews online I could find give it decent marks. I will have to stop in and put this place to the test soon. But it’s supposed to serve “Caribbean cuisine and Rum”. Sounds good to me! So…just about every food craving imaginable can be satisfied on this little stretch of real estate in Red Hook, St. Thomas.